Roof Safety Markers has developed three different types of attachments that would work on all types of roof fixtures. Our Universal Bracket was specifically designed to be just that, universal. It can be attached to flat surfaces with just two screws and to most piping with a worm clamp. Our Pipe Clamp has been designed to fit most pipe sizes. Open the clamp and attach to the pipe with just a screw driver. It's an easy and secure way to attach Roof Safety Markers to just about any pipe. Our L-Style clamp was designed to fit on skylights, vent hoods, and oddly shaped objects with easy application and removal. The L-clamp provided a quick solution to attach markers to odd or curved surfaces but may not be suitable as a permanent attachment in case of very high winds. In applications where the user expects the L-clamp to be subjected to high winds, we request that you use our Custom Surface contact page to request assistance from our design team. Roof Safety Markers Pipe Clamp is designed to easily attach to most pipes. Open the clamp and attach to the pipe with just a screw driver. It's an easy and secure way to attach Roof Safety Markers to just about any pipe. Order the pipe clamp according to the size of the pipe in your particular application. 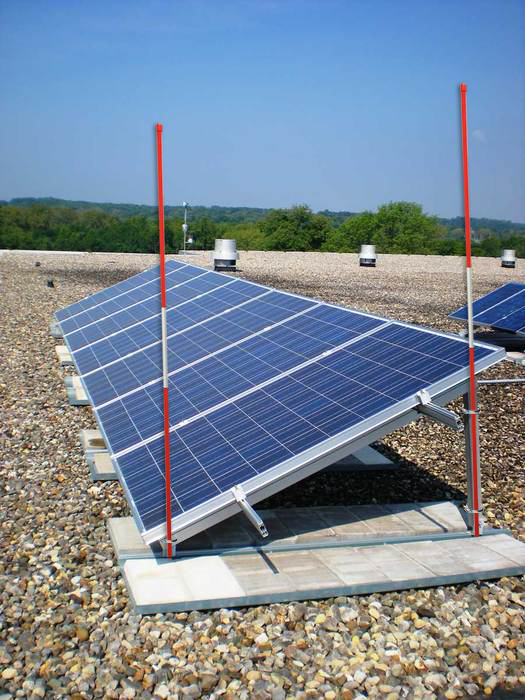 Roof Safety Markers are your solution to safely identify and pinpoint rooftop units and the pipes associated with them. Our Universal Bracket is designed to attach to the side of the unit with just two screws. For simplicity, you may attach the Bracket to the existing screws that are part of the roof top unit or skylight. As one of the major safety concerns on any roof, Skylights need to be clearly and visibly marked. We offer two different options for skylights, our Universal Bracket, and our L-Style Clamp. The Universal bracket is attached to the skylight frame with two screws, and the L-Style Clamp can be used when the skylight frame cannot be screwed into. Depending on the type of surface around your solar panels, you may use any of the three attachments: The Pipe Clamp for piping around your solar system, the Universal Bracket to attach to flat surfaces around the solar panels, or the L-Clamp for quick and temporary clamping to the solar system. Roof Safety Markers will easily attach to Vents without Caps. You can possibly choose our Universal Bracket with a worm clamp to attach around the vent. For Awkward or curved surfaces you may use the L-clamp. Roof Safety Markers will mark the edge of the roof and help keep your workers safe from falls. Using our Universal Bracket, easily attach with just two screws to the gutter or to the metal flashing coming down the roof edge. Roof Safety Markers is your solution for hard to attach to vents with caps. Roof Safety Markers A-Style Clamp will easily attach to the hood of the vent without screwing into the material. Simply squeeze the clamp and attach to the outer rim of the vent. If the surface of the cap is too thin, the user may add a piece of metal or a pressure-treated piece of wood between the clamp and the thin surface to add thickness. If the hood is able to accept screws our Universal Bracket can be used as well. 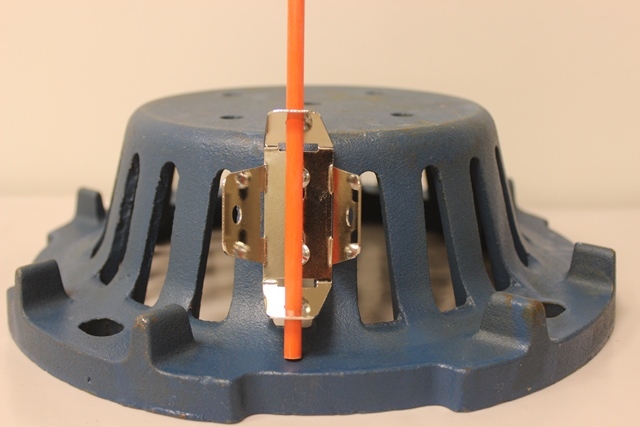 Roof Safety Markers will easily attach to roof drains with a tube clamp or a universal bracket. Thread the open clamp through the openings on the vent and secure with a screw driver. Easily mark and identify open drain locations. Roof Safety Markers wants to ensure your workers have all the proper Roof Safety Markers in place and ready at any time. We can customize your order with the proper attachment and markers. Simply upload a photo of your roof and we will contact you with the proper hardware and markers needed to complete your job.